How about bingo and slots at the same time? Now that is something unique! 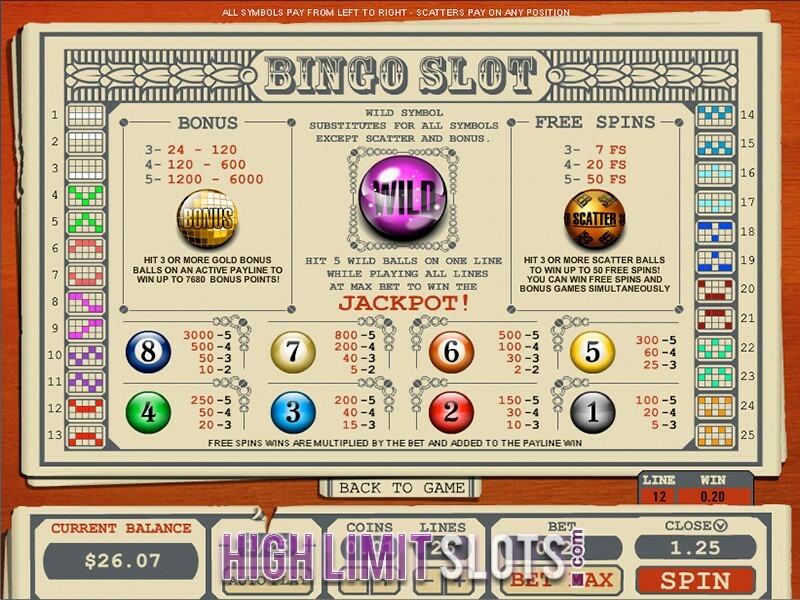 The Bingo Slots machine is a progressive 25 payline slot machine that makes you feel like you are playing bingo at the same time! 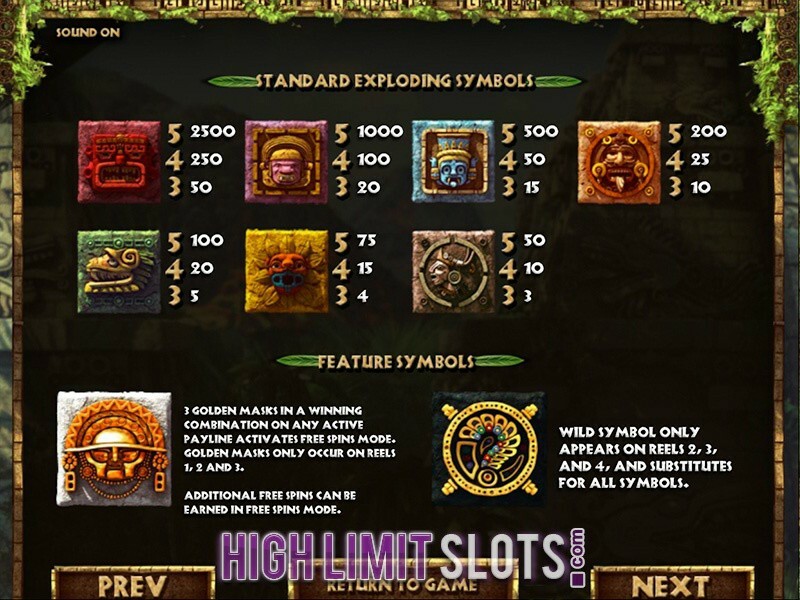 You can bet up to $75 on each bet for this slot machine and the bingo ball graphics will keep you entertained for hours. If you want to hit that massive progressive jackpot, keep playing until the purple bingo ball comes across in a row of five. Of course, the higher the bet, the higher the progressive earnings. If you hit 3 or more scattered balls, you will be awarded a number of free spins. 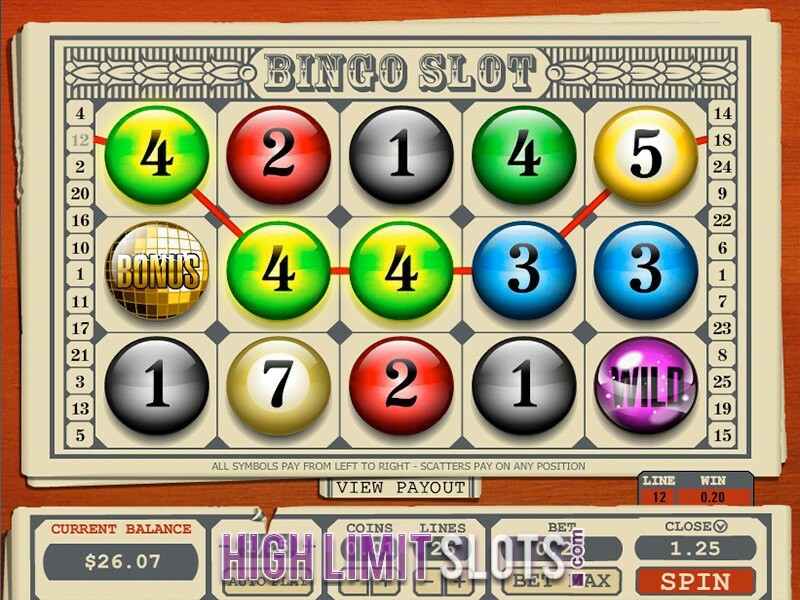 Overall, this is a very unique game that gives you a bingo theme on a slots machine – you cannot find this at many online casinos. 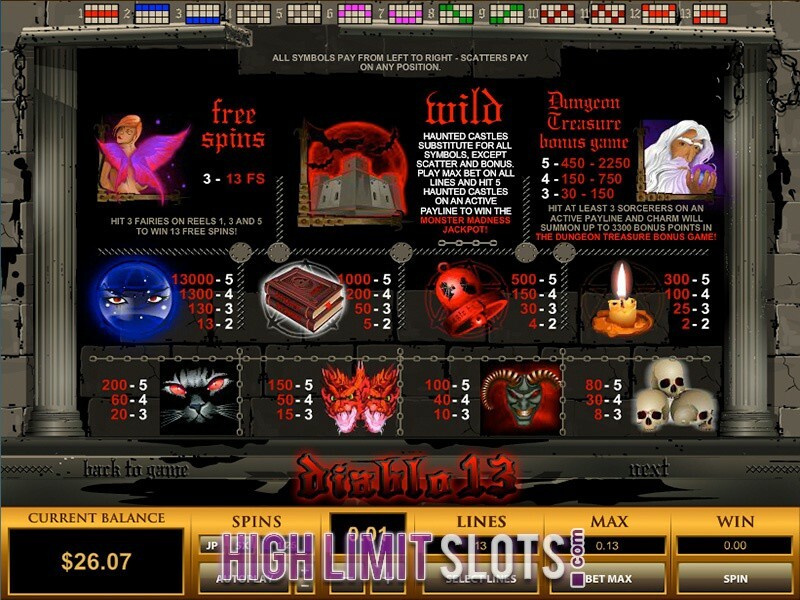 Diablo 13 is a unique 5 reel 13 payline slot machine featured at Black Diamond Casino. 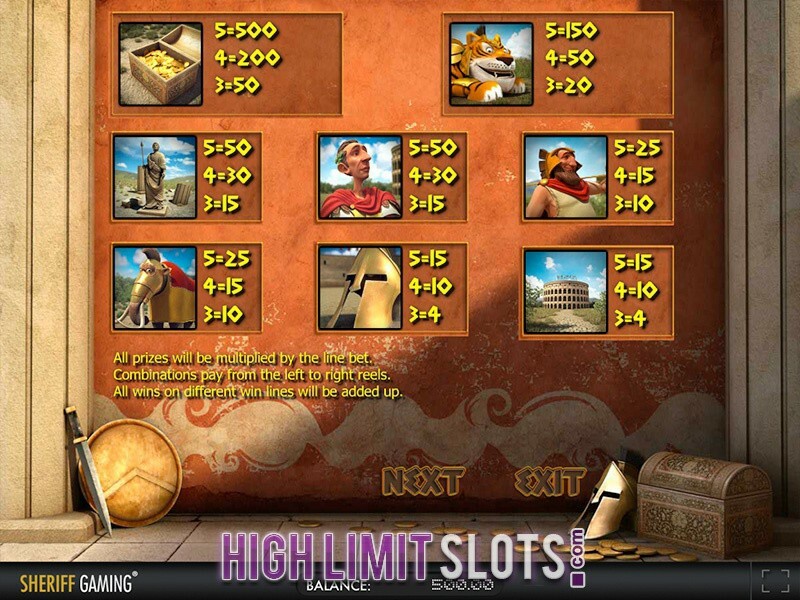 This slot has won accolades as being one of Top Game Software’s most entertaining games. What makes this such a great game is that it uses unique graphics and symbols with a cool color scheme of black and red. 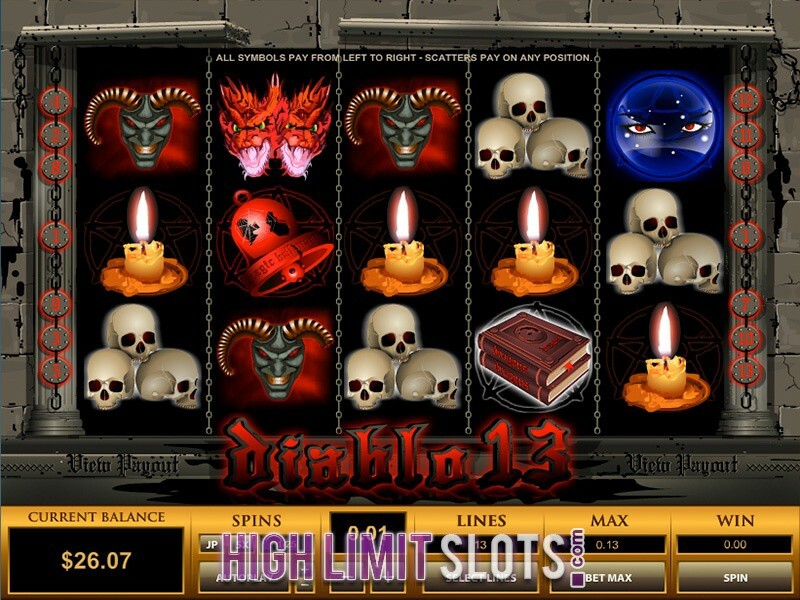 You have the chance to earn a number of free spins when a the diabolical elves hit the screen. You’ll be entertained by the array of icons that include: haunted mansions, skulls, candles, red dragons, cracked red bells, occult books, mystic eyes, fairies, wizards and red eyed cats. Join the frenzy with a chance to win up to $20,000 each time you pull the lever! 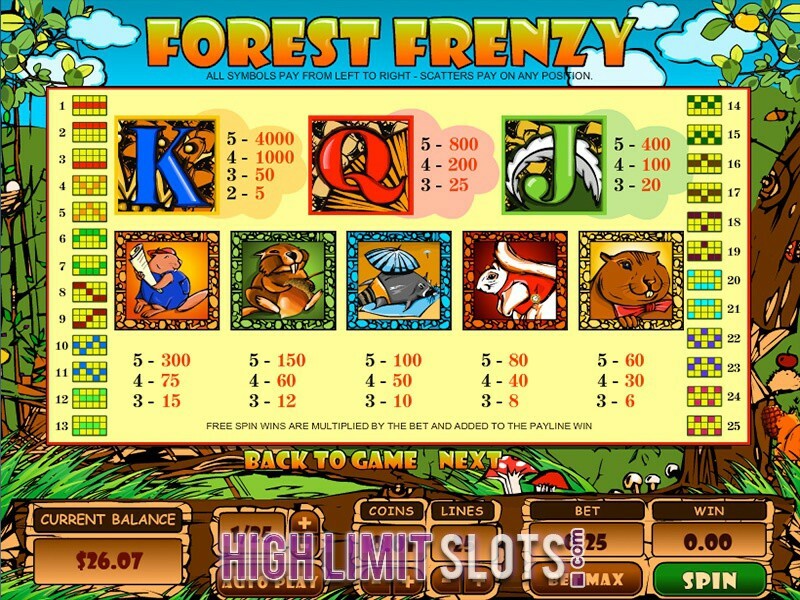 Forest Frenzy is a Top Game classic and features 5 reels with 25 paylines. Here you will find all of your favorite forest creatures in cartoon form. 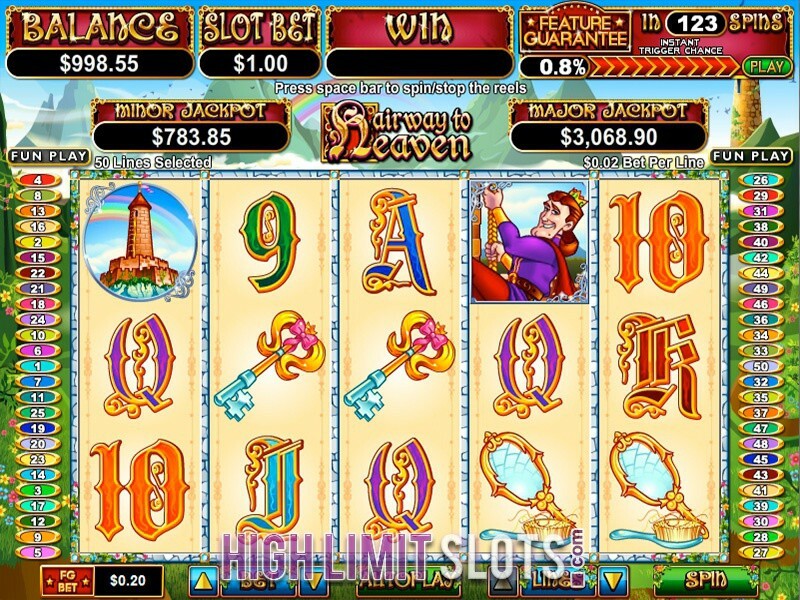 They will help bring you everything you need to hit it big on this slot machine. 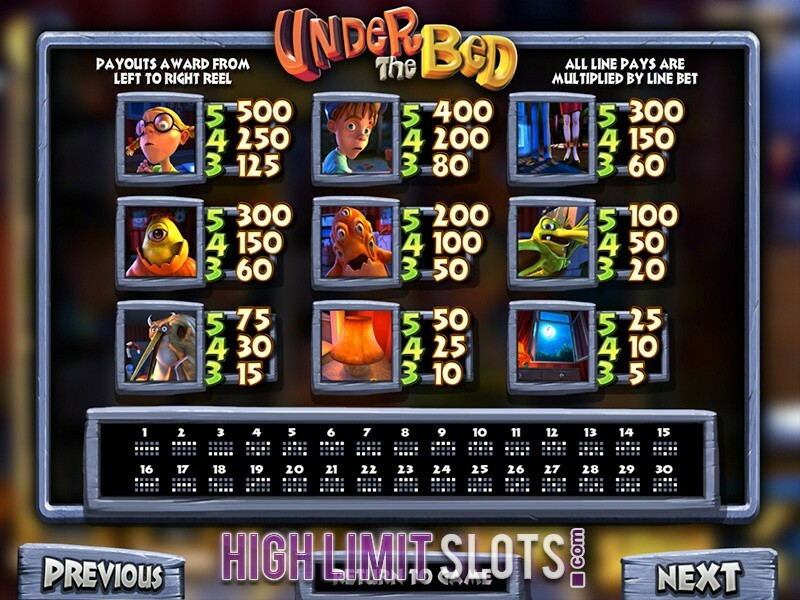 The best thing about this slot machine is that it gives high rollers the opportunity to bet up to $125.00 with each spin. That is massive! You will be hard pressed to find this at other online casino sites. Your best symbols are the acorns and pinecones. When your acorns hit on the 1st and 5th lines, you will be eligible for a number of free spins. With the pinecones, they will substitute for any other symbol accept the bonus or scatter icons. 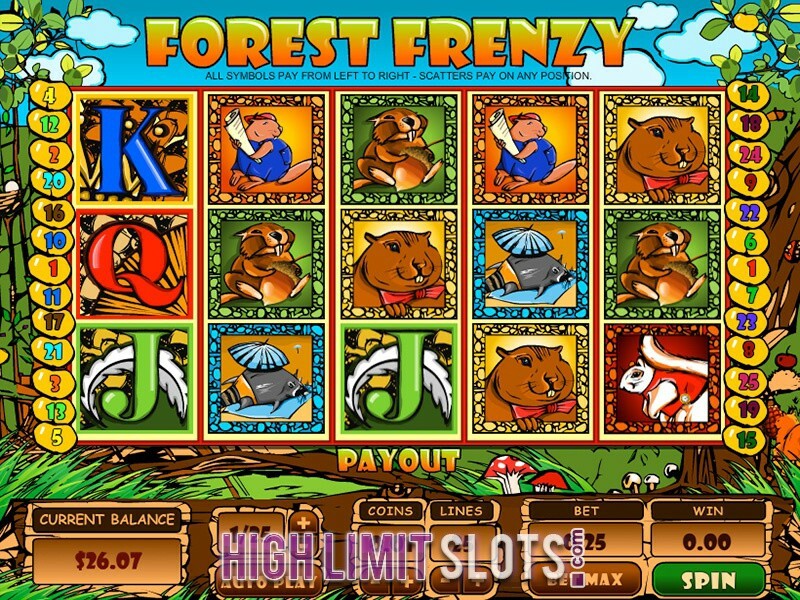 This slot will take you back to the forest and you will definitely get that retro feel with the funky graphics and cute music! In the glory days of Rome, only the bravest of men stood to fight in the arena. They were known by one name: Gladiator. The best of the arena meets the best of technology in this 3D 5 Reel masterpiece of blood, guts, and glory. Collect Hero Gladiator symbols to trigger the Gladiator Smash Wild Reel Feature. Collect Hero, Coliseum, and Villain symbols to trigger the Gladiator Battle second screen bonus round, then PREPARE FOR BATTLE and winnings! Help the handsome prince in his endeavour to win the heart of the beautiful princess and come to her rescue before it's too late. The princess will let her long hair down to help the prince climb to the tallest tower of the castle where she is being held, and there will be a some excellent reward scoming your way for making this happen. 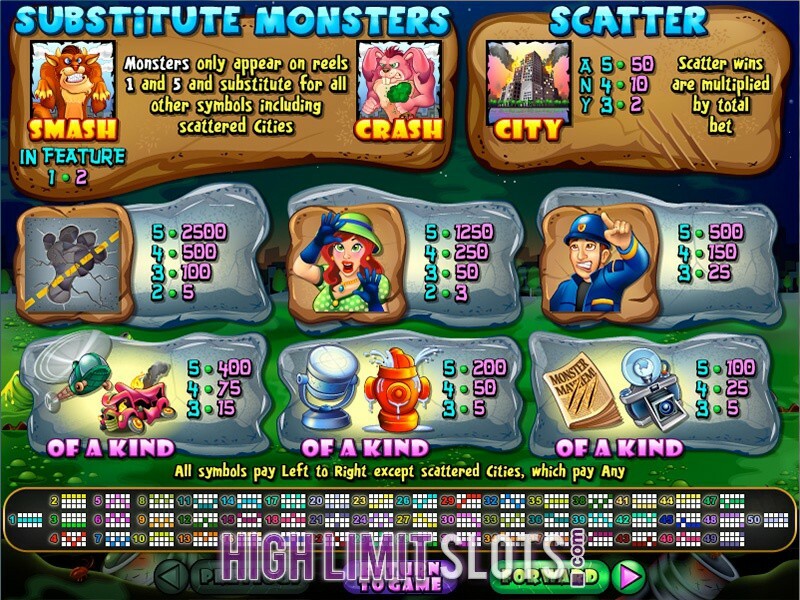 This RTG video slot will see you take on monsters Smash and Crash in an attempt to restore order to the streets of the city that is still trying to recover from their latest mayhem. The law abiding citizens can only do so much on their own and you assistance in dealing with the monsters will be much appreciated. 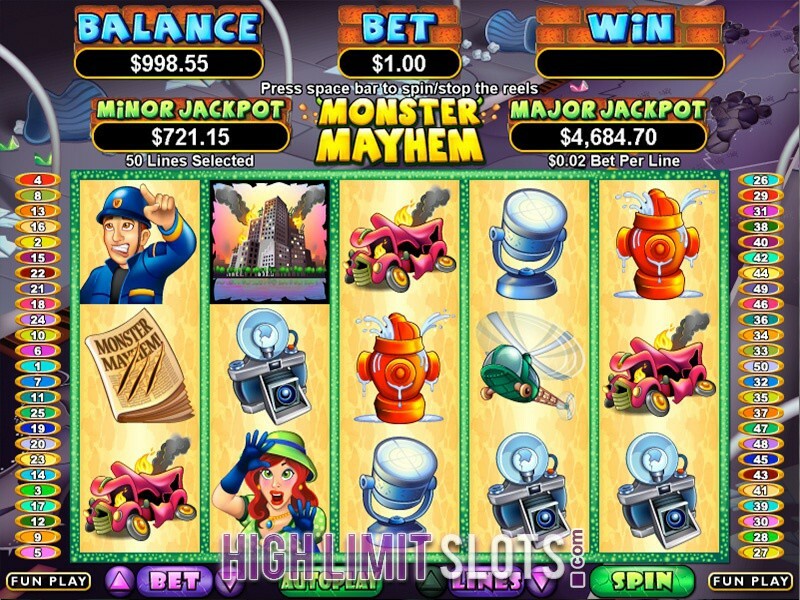 Monster Mayhem is a 5 reel 50 payline progressive slot game equipped with two progressive jackpots, but Smash and Crash monsters that also act as wild symbols only appear on reels 1 and 5. Monster Mayhem Feature may wreak havoc onto the game screen, but it will also award you up to 10 free rounds where multipliers increase with each spin to deliver some mind-blowing wins. Have you bean naughty or nice this year? 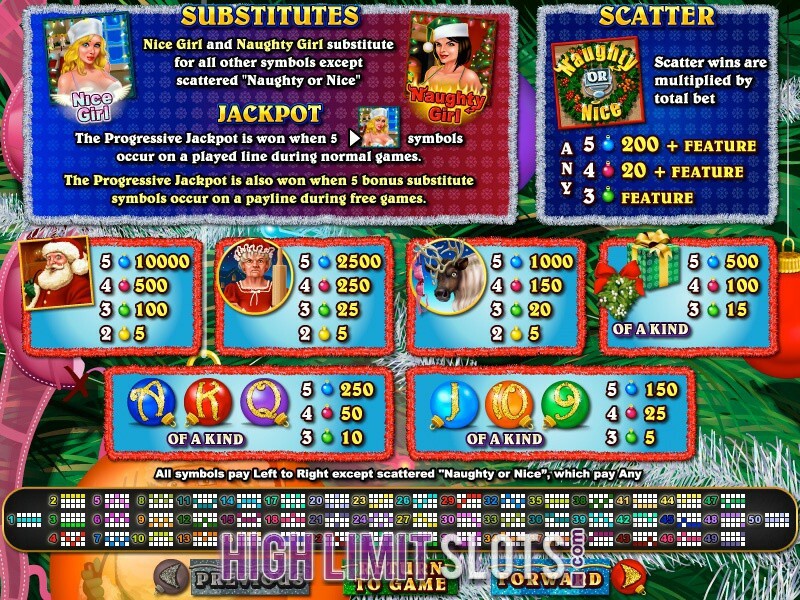 Whatever the answer you can expect some nice surprises when playing the popular video slot developed by Realtime Gaming, with nice girl and naughty girl in place to spice up the festive atmosphere. Mrs. Claus doesn't seem to be too happy by the presence of scantily-clad ladies on the reels, but we are sure you will not share her opinion, especially as the two girl symbols double all payouts when substituting in a winning combination. 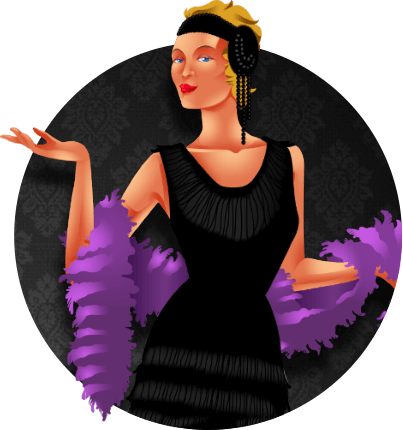 At least three Naughty or Nice scatters anywhere award 10 free games, whereas five nice girl icons occurring on any active payline will see you land the game's lucrative progressive jackpot. Following on the hugely successful Rudolph's Revenge and Santa Strikes Back, Return of the Rudolph is the third Christmas themed video slot from RTG that comes with 5 reels and 50 fixed paylines, allowing you to bet up to $250 per single spin. 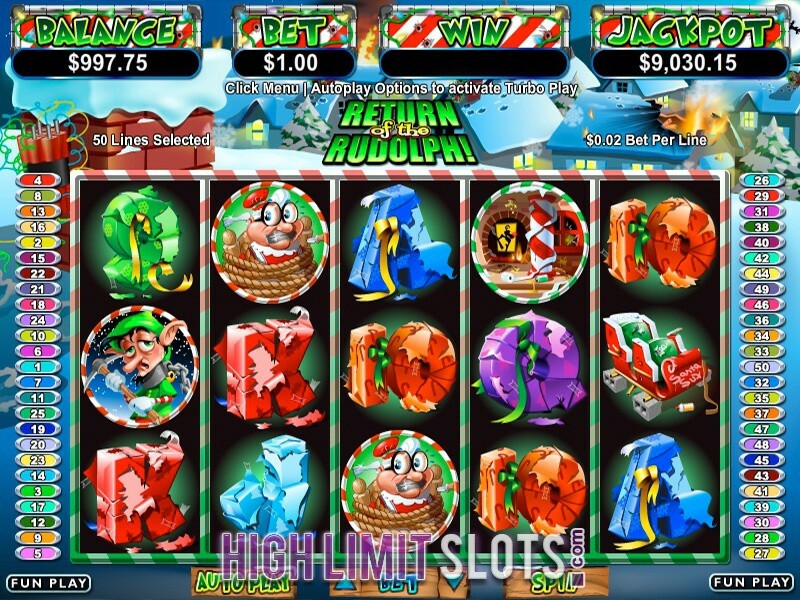 Three or four thugs scatters anywhere on the reels unlock Pick a Feature, where your choice will result in one of Rudolph's Rampage, Santa Strikes Back or Rudolph's Revenge features being triggered, awarding free games, great multipliers and many more. Should you happen to receive five thugs scatters, the attractive progressive jackpot will be yours. 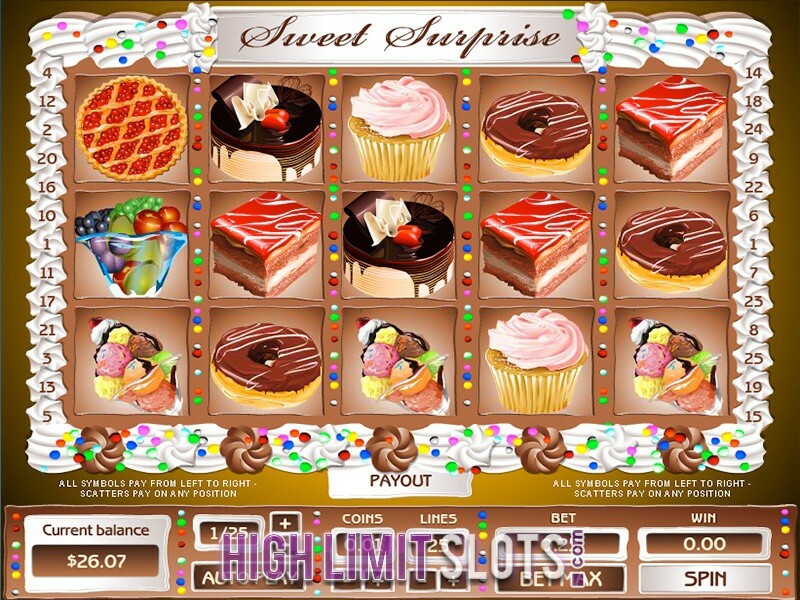 Its always great to find a Sweet Surprise at your favorite online casinos, and Black Diamond definitely has a sweet surprise for you with its 5 reel 25 payline Sweet Surprise slot machine. 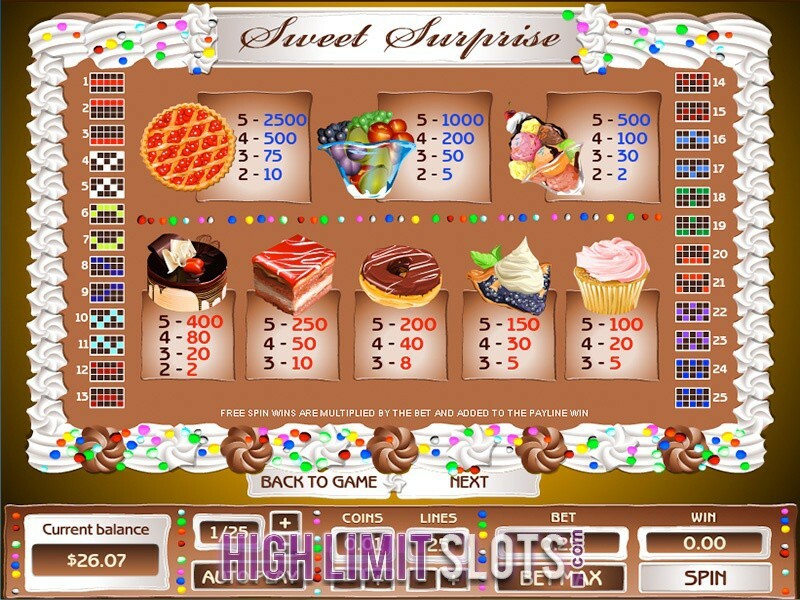 Bet up to 625 coins – 25 coins on each line – as the different sweet surprises come across your screen. There are multiple coin denominations that help you determine the best betting style for you. This game has always been a favorite classic of online slot enthusiasts who enjoy playing the different slots by Top Game Software. 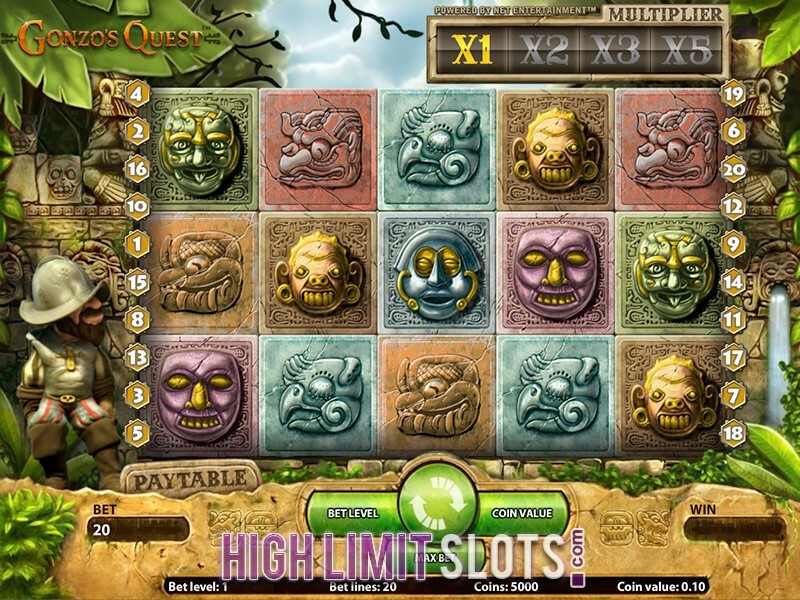 This is a progressive jackpot game that is friendly with the Free Spins. 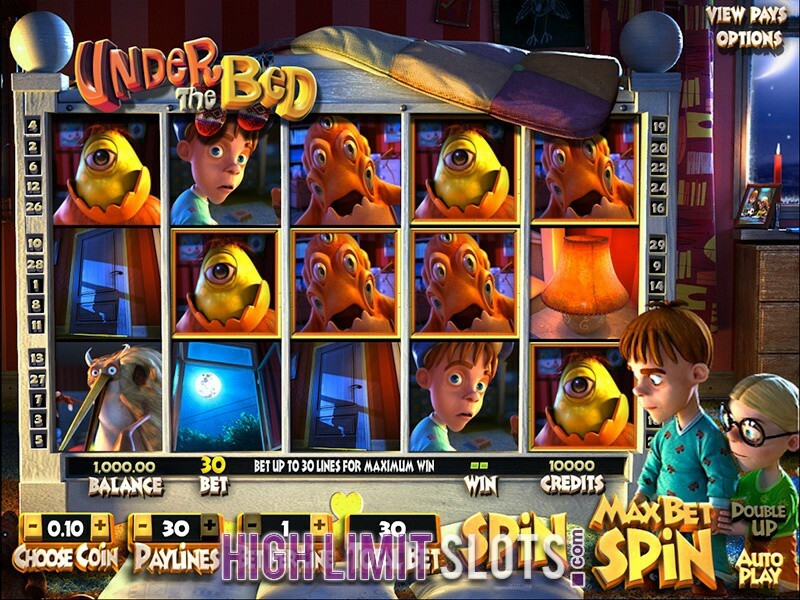 You’ll have the opportunity to get up to 10 free spins each time you spin the reel. 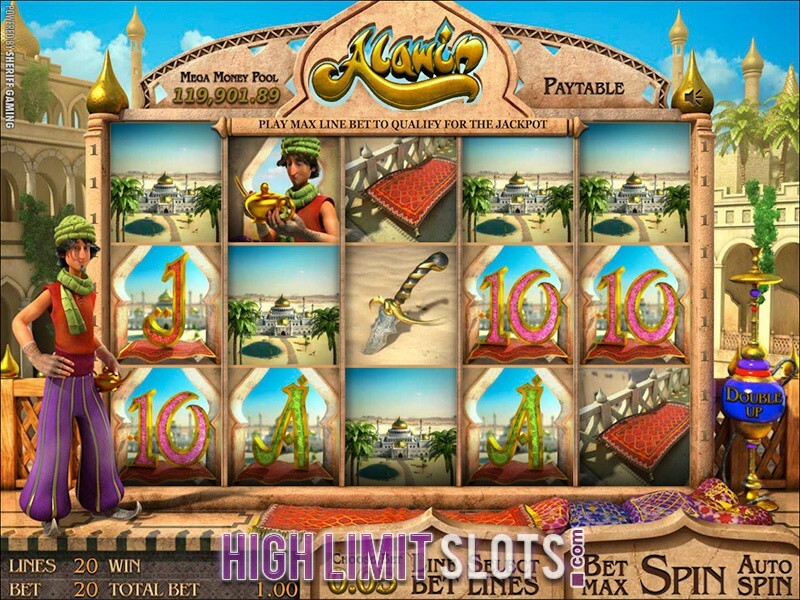 A 5 reel 20 payline 3D slot from Sheriff gaming, Alawin features a reference to the 18th century folk tale Aladdin, where the main character is accompanied by the genie of the lamp and magic carpet that is his favourite form of transport. Three magic carpet scatters anywhere on the reels trigger the Click Me Bonus, where you select one magic carpet to reveal an instant prize. Get three or more Alawin icons to appear in any position and you will activate the Feature Bonus. Credits and multipliers are hidden in special baskets at the bazaar so select as many baskets as you can before the word collect appears and ends your bonus round. You do get to keep all the magnificent prizes won during the feature. Five dagger icons on an active payline award the amazing progressive jackpot, with Mega Money Pool paying out in excess of $100,000. Follow seasoned marine explorer Pierre La Mer as he makes the biggest discovery of his life and uncovers the lost city of Atlantis that has so long occupied people's imagination. The 5 reel 20 payline game from Sheriff Gaming will blow you away with its deep sea theme and impeccable graphics, but things really get interesting when we get to special bonus rounds. 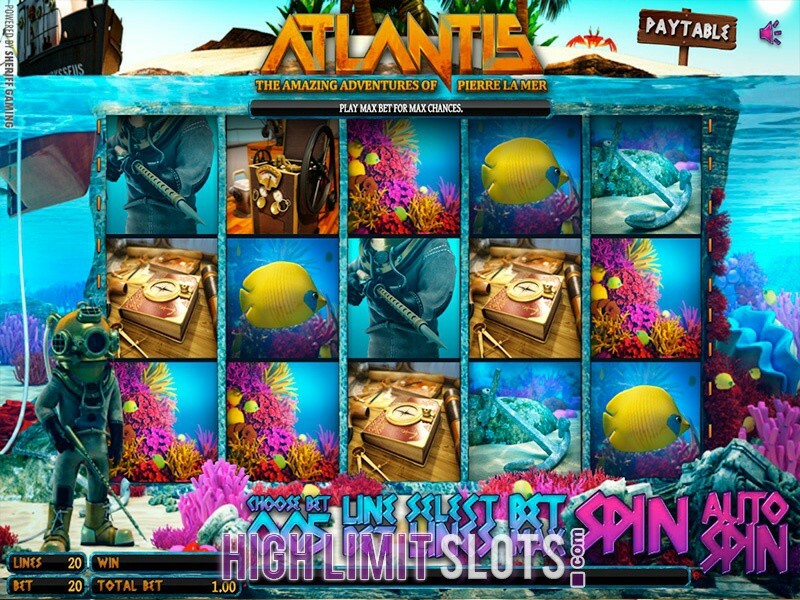 Play Atlantis 3D slot to win up to 40,000 coins during normal play, or strike it big by triggering one or more of its impressive special features. Expanding Wilds, Click Me Bonus, Free Spins Bonus and Scatter Prizes are all in place to give players a fair chance of landing those life-changing payouts, awarding instant prizes, multipliers and up to 25 free spins. The robot egg factory was not really in perfect working order, but a mad rooster has managed to saved the day by inventing EggOMatic, a unique machine that keeps churning out the eggs onto a conveyor belt and in turn increases your bankroll with some formidable payouts. 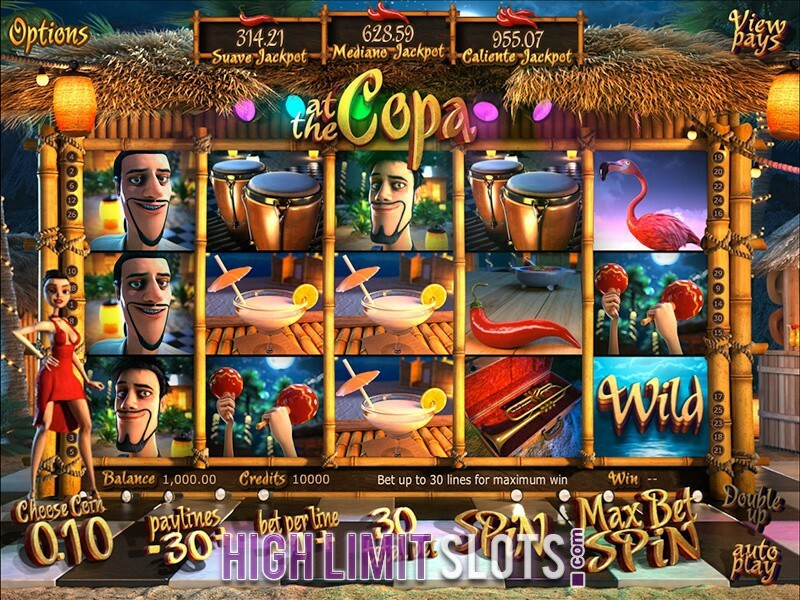 The 5 reel 20 payline slot features 3D action, extremely interesting game play and maximum bet up to $200. 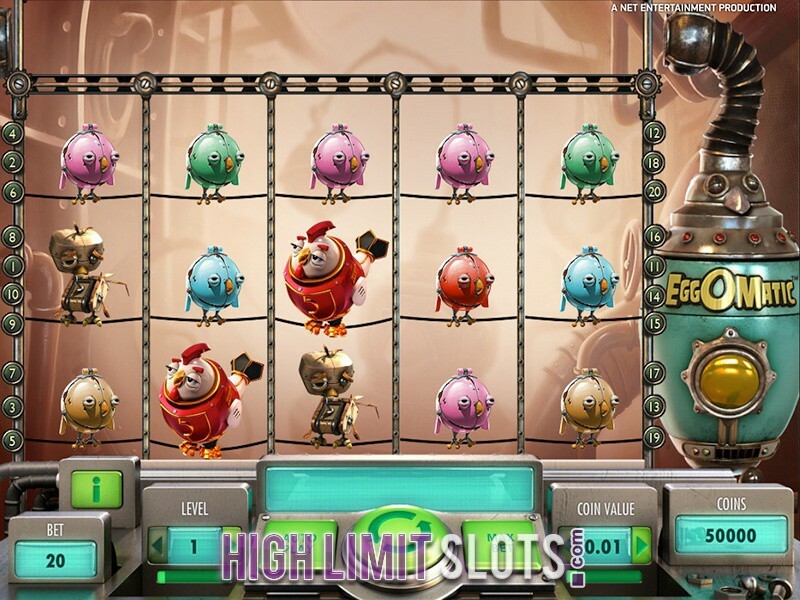 Spend some time at the reels to spot Spreading Wild Egg, Free Spins Egg, Coin Win Eggs and Surprise Egg on the conveyor belt and you will win up to 50 free spins and 94,750 coins. 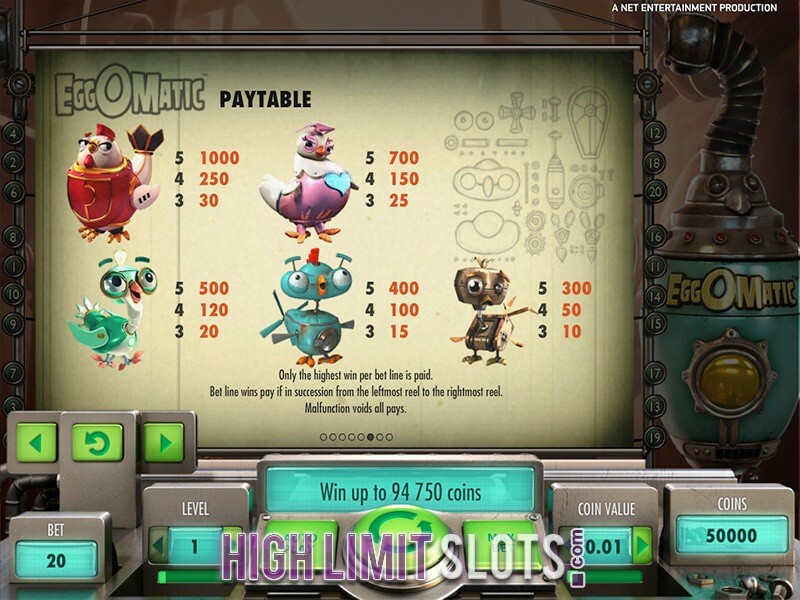 These innovative features not only add to the general gaming experience, but also improve your winning chances and boost your line payouts, with “the more the merrier” phrase springing to mind every time we play EggOMatic. Travel to the future with Extreme 3D slot and brace yourself for a gaming experience unlike any other. Don't be fooled by the somewhat poor payouts during normal play given that every multiplier cube icon will multiply your line wins up to massive 25 times. 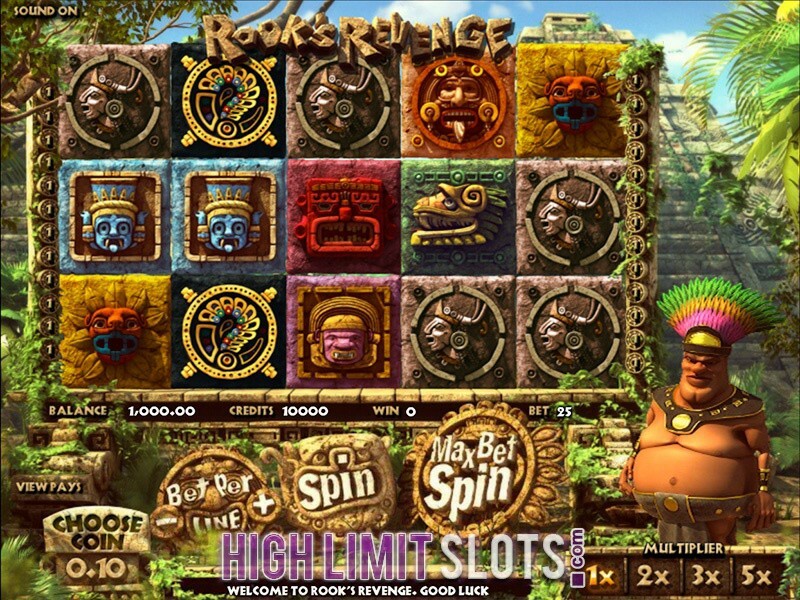 Activate the Dropping Wild feature and you will be awarded free spins as long as the symbols are visible on the reels, or receive up to 30 free spins when three or more flaming cubes occur in any position on the game screen. 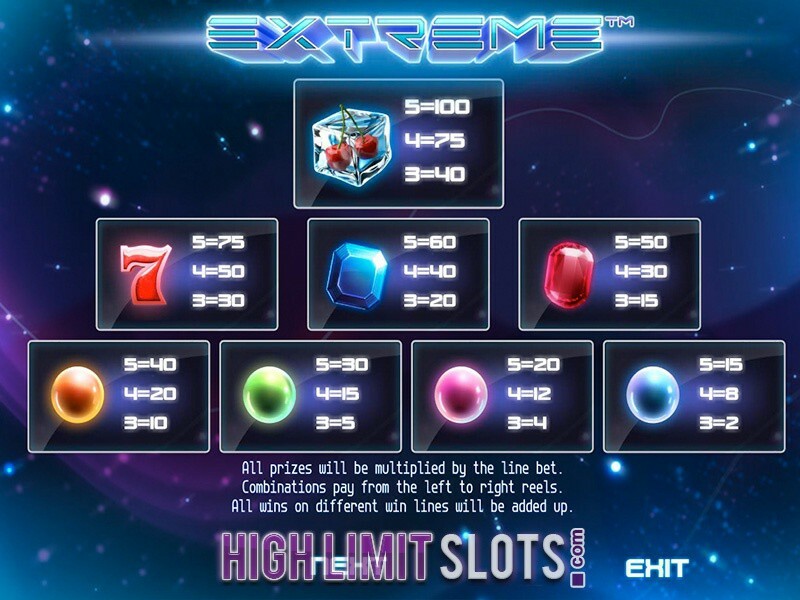 Extreme is a 5 reel 20 payline video slot with a futuristic theme that is just perfect for high rollers, not only because players can bet up to $500 per single spin, but also due to the fact that random multipliers and rewarding free spins round can lead to some amazing payouts. Famous Spanish conquistador Gonzalo Pizaro has set out to find El Dorado, a place where gold lies in abundance. The colourful character needs your help if he is to succeed in his quest, and he is prepared to reward your loyalty by turning you into a millionaire. Take advantage of the unique avalanche feature that will see symbols explode each time they form a winning combination, allowing new icons to fall into their place and increasing your total multipliers. Receive three free fall icons to activate 10 free falls, and keep getting those Wild icons to increase your winning chances. With multipliers during normal game and free spins going up to 5x and 15x respectively, Gonzo's Quest can really help you strike gold even if El Dorado eventually eludes you. 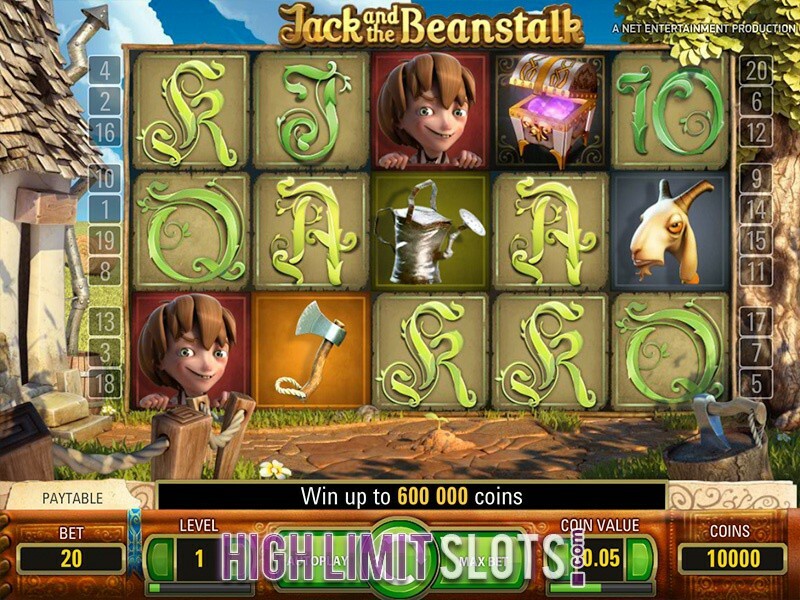 The famous British fairy tale has been brought to life by Net Entertainment, with the famous software developer making sure their latest 3D slot nicely portrays the spirit of innovation they have become famous for. 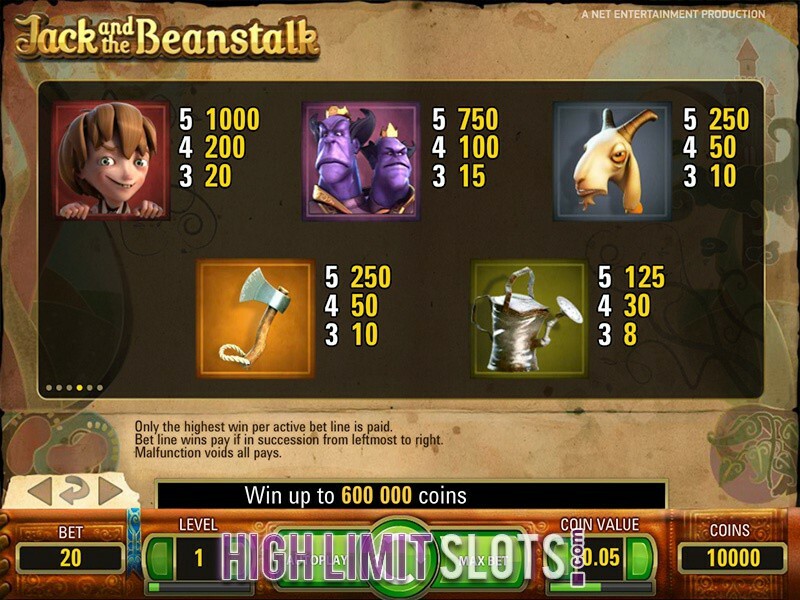 Thanks to the Walking Wild feature, each Wild symbol on the reels of Jack and the Beanstalk will not only triple your prizes, but will also see the icon move one reel to the left, awarding free spins and replacing other symbols as long as it is present on the game screen. 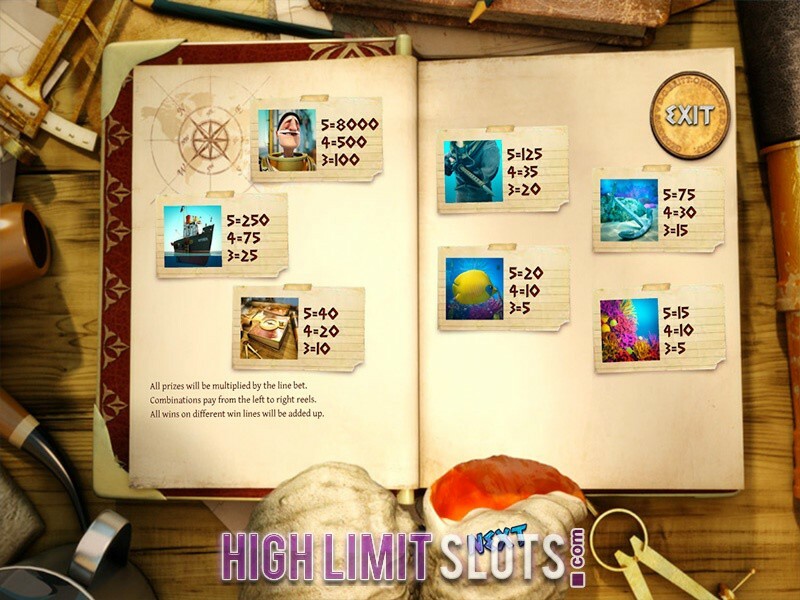 Get three Scatter icons to activate 10 free spins, and then collect as many key symbols to trigger Treasure Collection round where you can unlock additional extra features. Wager up to $100 and spin the reels of the 5 reel 20 payline 3D slot to get one step closer to massive payouts that go up to 600,000 coins. Assume the role of famous outlaw Robin Hood and start stealing from the rich to feed the hungry and clothe the poor. 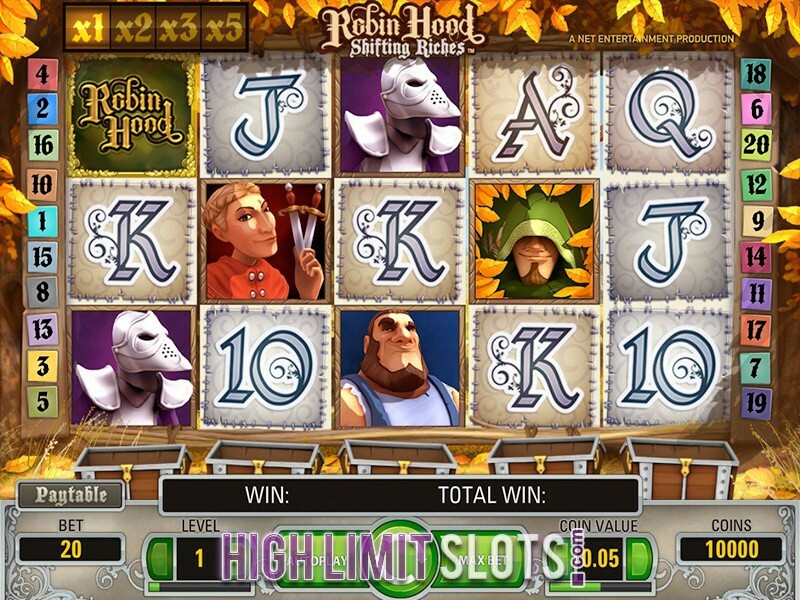 Chances are NetEnt's Robin Hood: Shifting Riches will give you endless hours of quality entertainment, whilst offering a fair chance to turn a nice profit in the process. The 3D slot comes with five reels, twenty paylines and two innovative features that could easily make you fall in love with this slot game. Keep collecting money bags at different bet levels and coin sizes and once you amass four of these in a single chest, the free spin rounds will be activated. 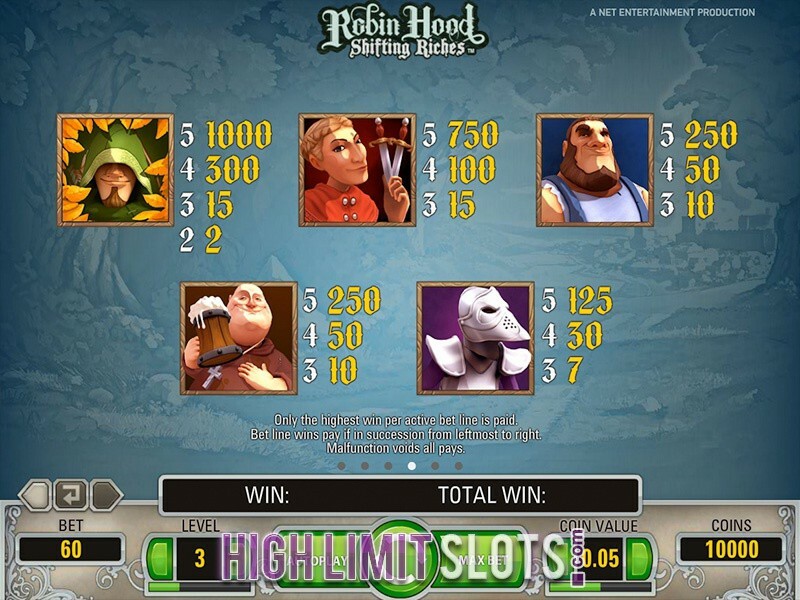 Alternatively, you can trigger the free games round with two or three free spin symbols, but Shifting Reels remains the best thing Robin Hood: Shifting Riches has to offer. 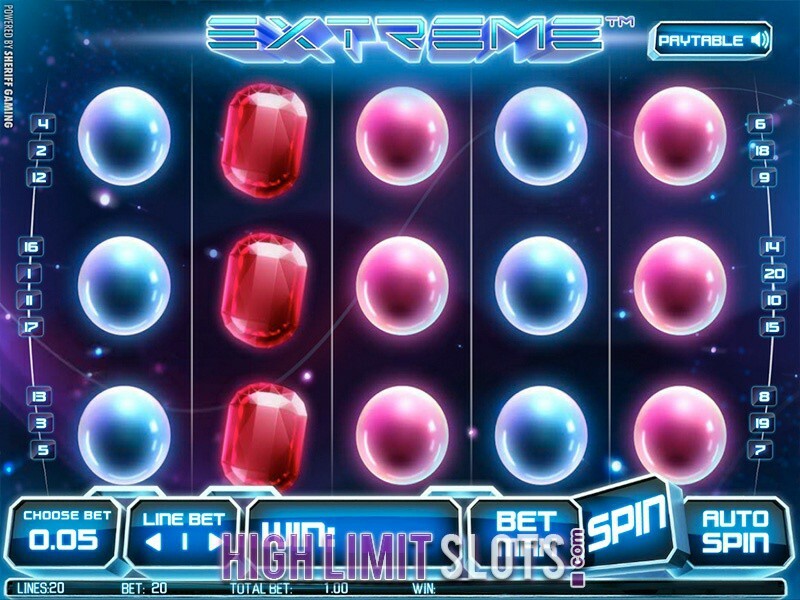 Each time a winning combination occurs, the reels will shift for a chance at extra wins with multipliers up to 5x. Start placing your bets and watch how your account balance just keeps growing. Prove your warrior skills in the ancient city of Sparta and the emperors will be more than happy to reward you with gold coins for every triumph in the Arena. The 5 reel 30 payline slot from Sheriff Gaming celebrates the true military spirit, with 3D animations adding to the general experience. 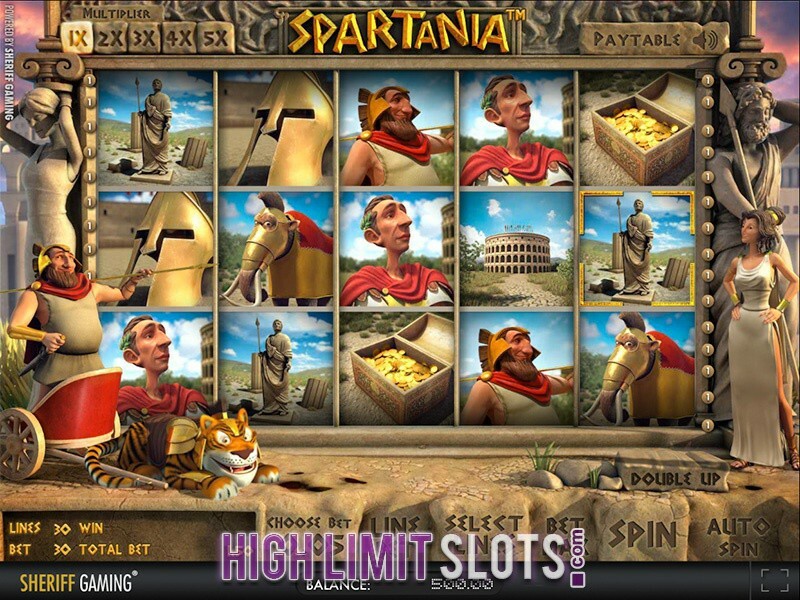 Spartania 3D slot offers so many ways to win, featuring special multipliers during normal game, double up option and expanding wilds. 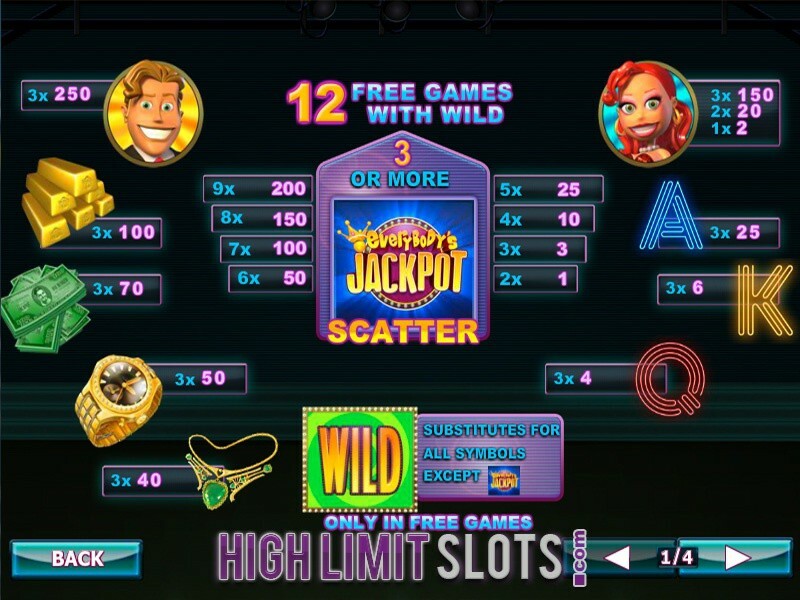 That is just for starters though as players can earn up to 100x multipliers through the Wheel of Fortune or receive instant prizes in the second screen bonus round. 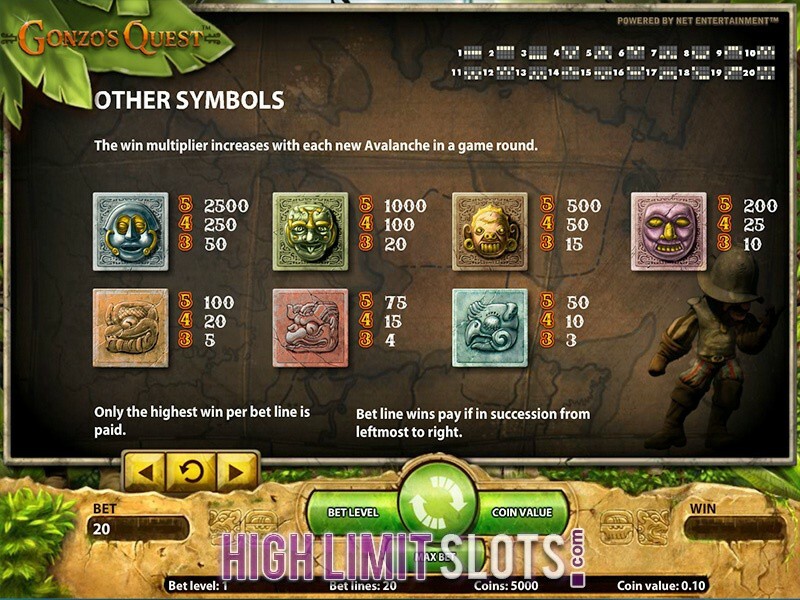 Three queen symbols unlock the bonus round, where a warrior keeps turning the coins to reveal instant prizes and he continues to do so until the world collect appears. 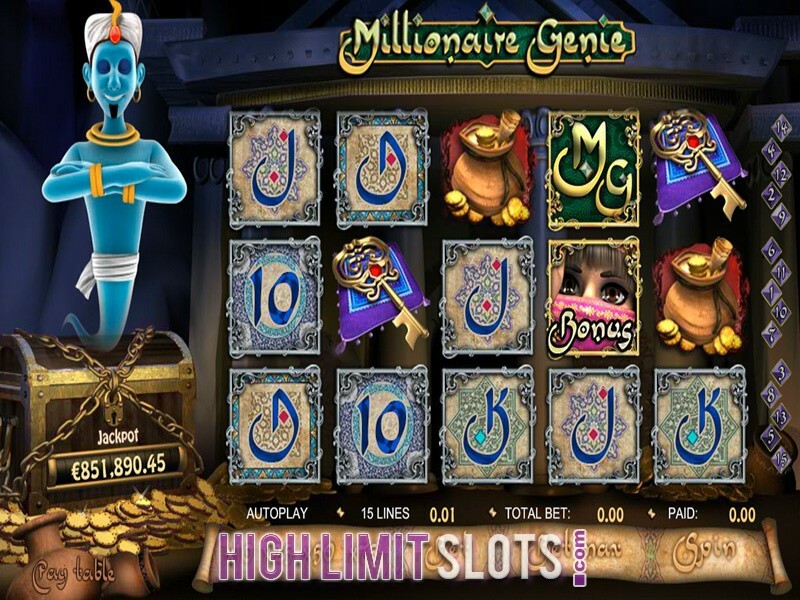 Play Millionaire Genie video slot to enter an enchanting world of magic, hidden treasures and intrigues, where even your wildest dreams may come true. The 5 reel 15 payline slot game guarantees an amazing gaming experience thanks to expertly designed game symbols and 3D animations. 888Casino revamped one of their most popular progressive jackpot games in August 2013, seriously improving the graphics and animations while also adding few more special features. 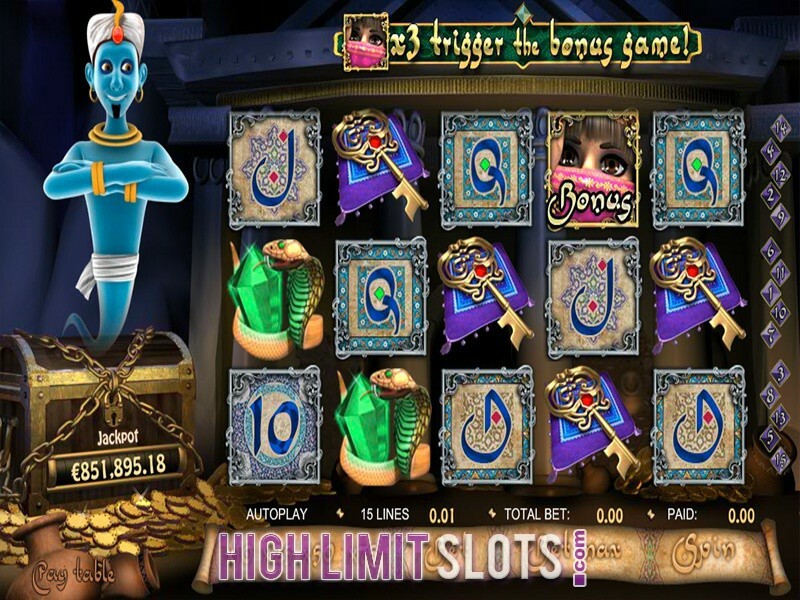 Three genie symbols scattered anywhere on the reels award random number of free spins, with Wild icons added to the reels. Three girl icons in any position unlock the second screen bonus round, where you are given instant prizes and special multipliers. 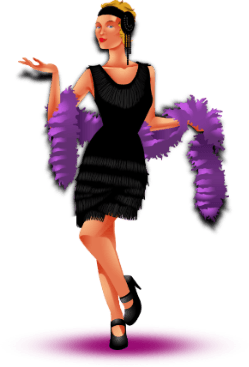 The high-value progressive jackpot can be awarded randomly at the conclusion of any game, so you will need a smile from the Lady Luck to win the top prize. 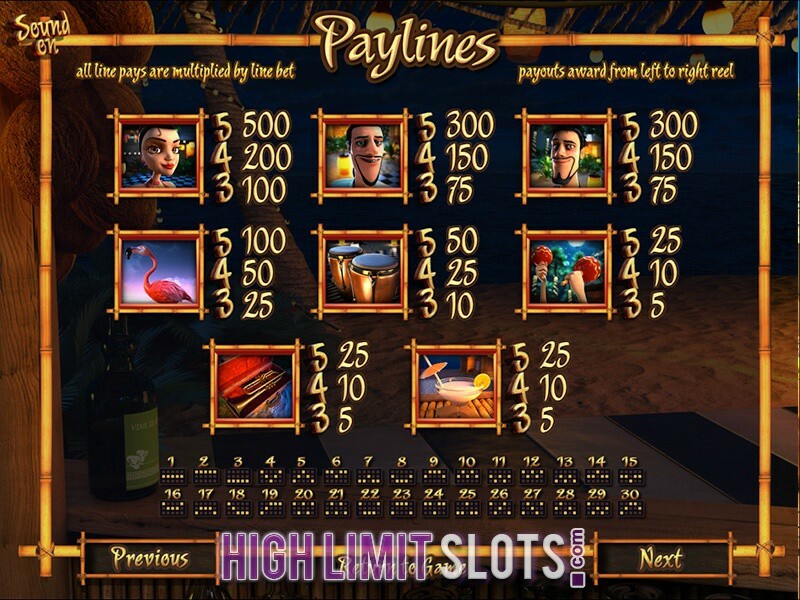 One would think that 3 reel 8 payline game is a simple slot machine without too many chances to land hefty payouts, but oh how they would be wrong. 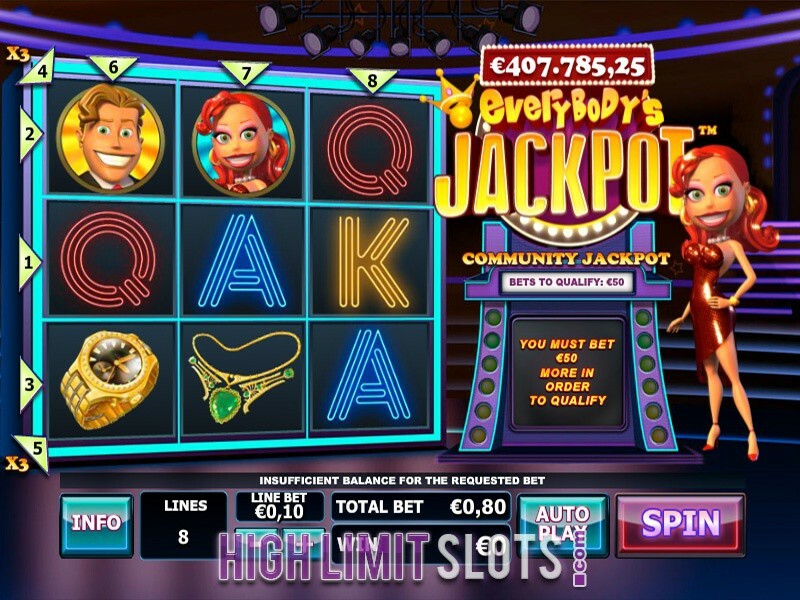 Everybody's Jackpot is rather a highly entertaining video slot that is brimming with special features. With symbols paying left to right, top to bottom and diagonally at a 3x multiplier, the winning combinations just keep coming. 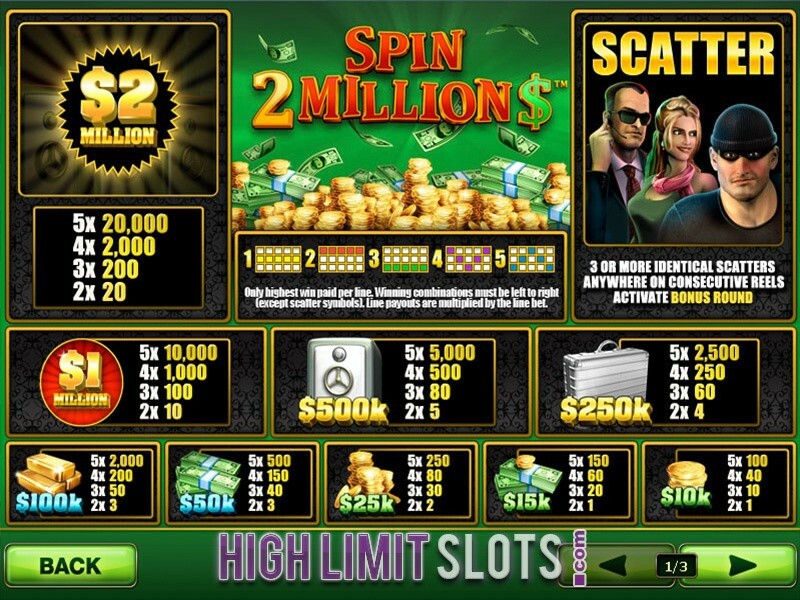 Meanwhile, Scatter payouts can multiply your total bet up to 200 times, whereas 12 free spins are awarded when three or more Scatters occur anywhere. Last but not least, the Playtech's pride and joy is equipped with a progressive jackpot that is awarded at random. The best thing here is that you can win your share of the amount every time someone else triggers the jackpot by simply wagering $66.69 in the 24 hours prior to the prize being awarded. 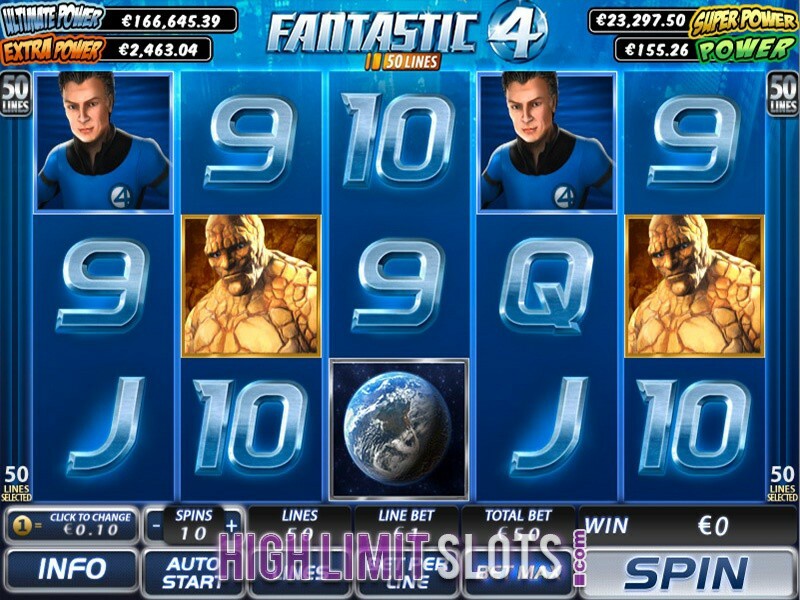 Play Fantastic 4 video slot to join forces with the ultimate superhero team and help save the world from Doctor Doom and his vicious plans. 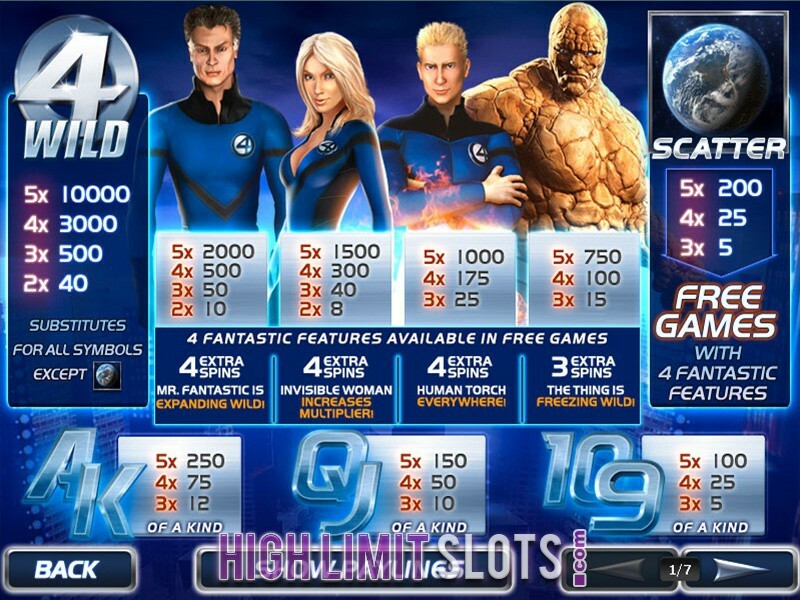 The 5 reel 50 payline slot game is linked to Marvel Multi-level Mystery Progressive Jackpot, but it also offers numerous other ways to land massive payouts. Receive at least three Globe Scatters in any position to unlock 12 free spins that come with four amazing special features. Get the main characters Mr. Fantastic, Invisible Woman, Human Torch or The Thing to appear during the free spins round for expanding Wilds, increased multipliers, extra spins and freezing Wilds. 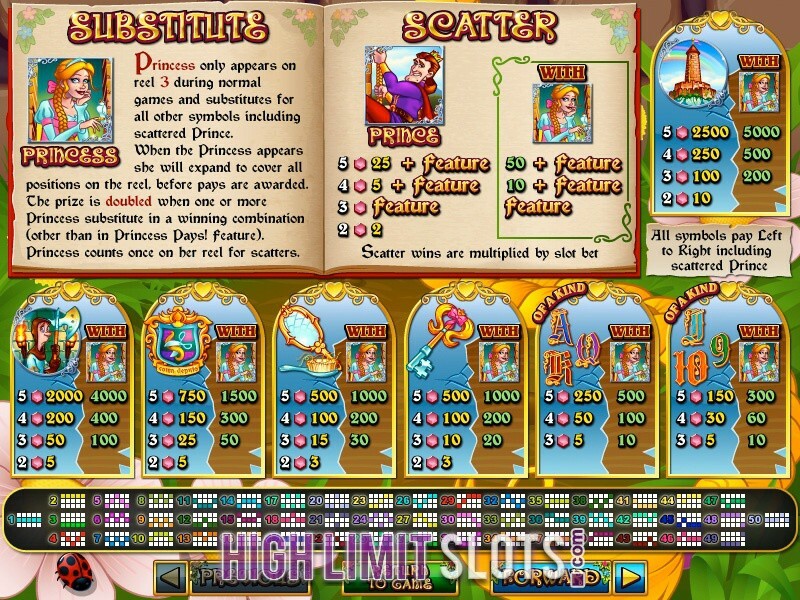 The jackpot game may be triggered at random, but high rollers have a better chance of activating one of four progressive jackpots as the higher the bet the bigger the chance of entering the jackpot game. 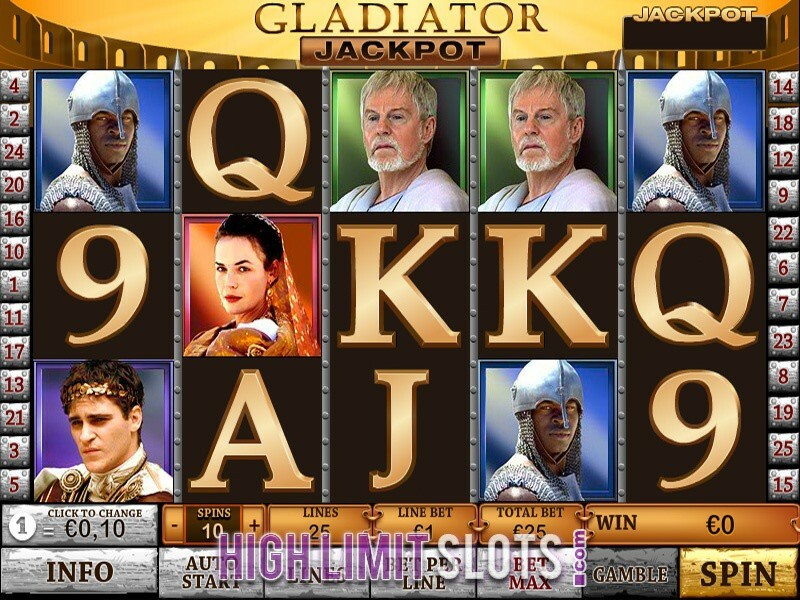 Gladiator Jackpot video slot will help online gamers relive one of the best historical movies ever with the game featuring original scenes from the 2000 blockbuster. 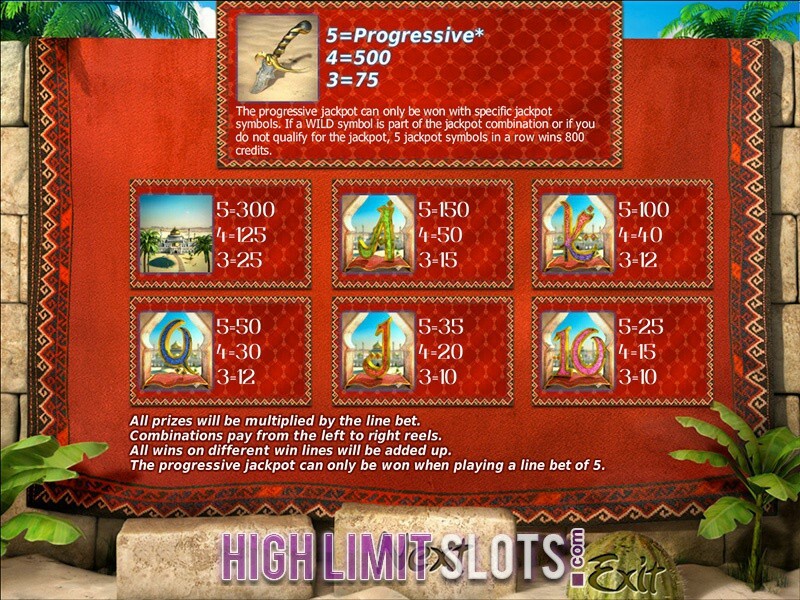 The 5 reel 25 payline slot has recently been equipped with a high value progressive jackpot that usually awards amounts of £500,000 and upwards. While you will enjoy seeing the likes of Russell Crowe, Joaquin Phoenix, Connie Nielsen and other actors from the original cast appearing on the reels, chances are you will be even more impressed by the amazing special features. 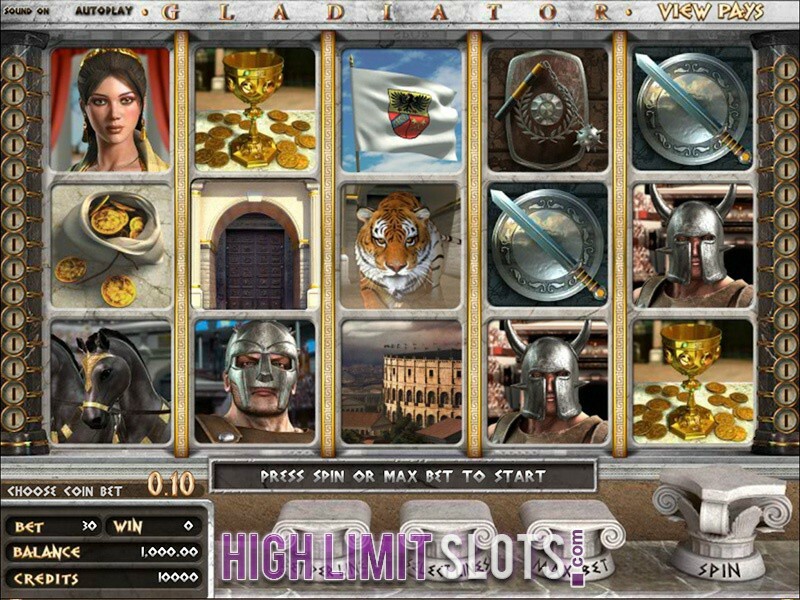 Bet up to £250 per single spin and you could receive hefty payouts by triggering scatter wins, Gladiator Bonus or Coliseum Bonus. 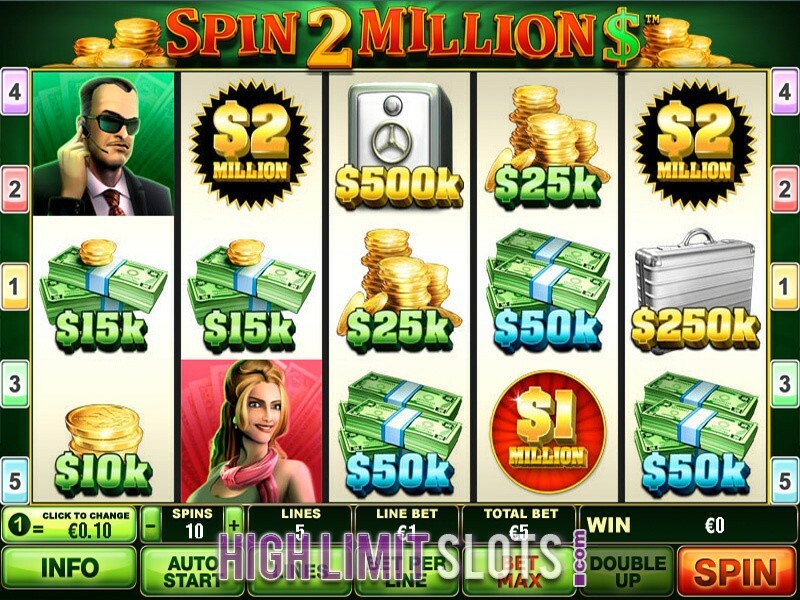 Spin 2 Million may come with 5 reels and just 5 paylines, but with wads of cash and golden bars populating the reels at all times, you are instantly reminded of the possibility of claiming big wins. 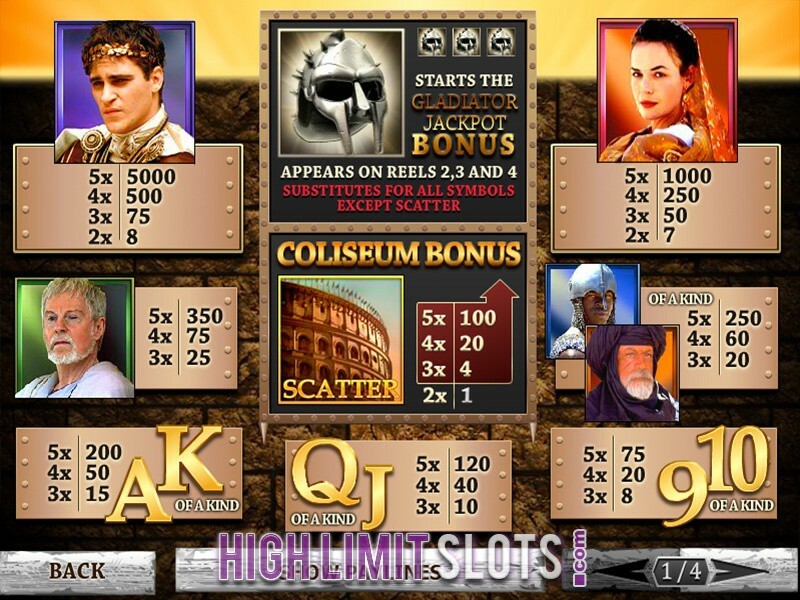 Land the 20,000 maximum coin jackpot during base play when five $2 million symbols occur on any active payline. Allowing bets up to £250 per spin, the lucrative video slot is just perfect for high rollers, with double up option also in place to help improve your line wins. The game has no less than three Scatter icons, with any of these triggering the bonus round. Get three identical Scatters to occur in any position and the second screen bonus game will be activated. Choose which of the three safes to crack and once the burglar has finished his job, you will be awarded a cash prize. 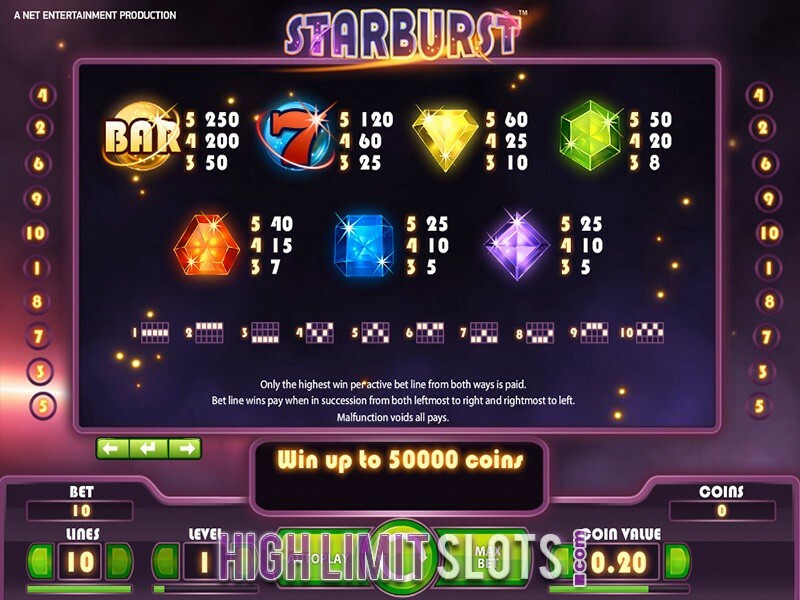 Starburst video slot from NetEnt will take you to outer space where stars shine so bright that it's difficult not to be impressed. And while different space objects are visible in the background, the game screen is populated by precious gemstones that keep churning out those winning combinations. 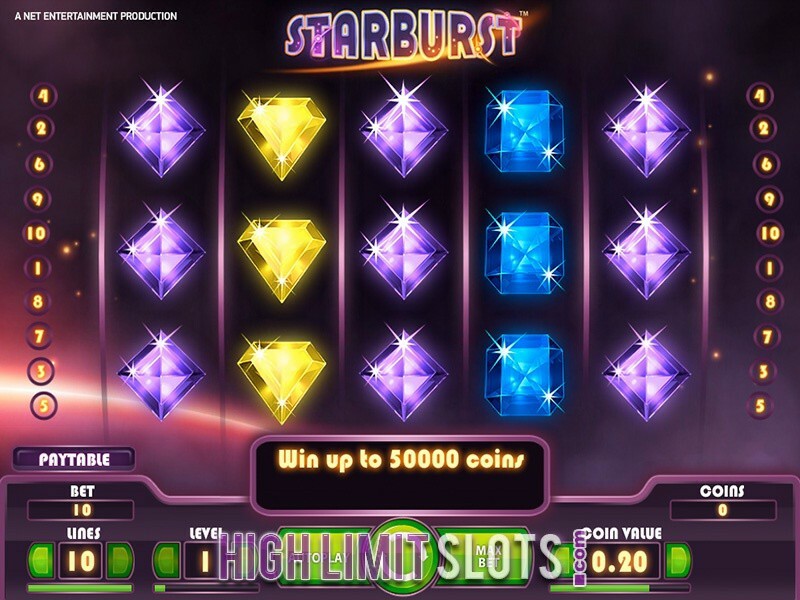 Coming with 5 reels, 3 rows of symbols and 10 active paylines, Starburst gives players a chance to win up to 50,000 coins at one time, with eye-catching graphics and soothing sounds creating an amazing atmosphere on the reels. Expanding Wilds are in place to seriously drive up your earnings during normal game, whereas Win Both Ways feature further increases your winning chances, seeing as how it is the reason why regular game icons form winning combinations both left to right and right to left. When you are looking for the best high limit slots games you want to play ones that are powered by excellent software you know you can count on to produce secure games of the highest quality. The software will dictate the design of the games, how well they perform, what special features they offer, their denominations and payouts, and other aspects. This is why it will prove to be important for you to pay attention to the software and familiarize yourself with the better software that has already proven itself to the industry. A few names to keep in mind are Betsoft, Microgaming, and Playtech; these software providers have become known as the best in the industry due to their ability to provide many of the best games online, including some of the best high limit slots games. Finding the best high limit slots games will be much easier if you focus on finding games run on specific types of software. By narrowing down the list this way you will be ensuring that you are going to be able to count on the games you find to give you everything you are looking for in a game. When you are going to be spending a large amount for each spin, you want those spins to be worth it and they will be when you choose to play solid games with all the features you want. When you choose to play the best high limit slots games you will be able to bet up into the thousands per spin and you will get to enjoy having the chance to win absolutely huge wins along the way. You will find interesting and exciting themes so you can really get into the game and enjoy the whole experience. US players are also invited to enjoy the high limit slots and there are some reliable and excellent online casinos that offer them games they will be pleased with. If you are looking for a good casino to play these games at then one casino you want to pay attention to is GrandParker Casino. 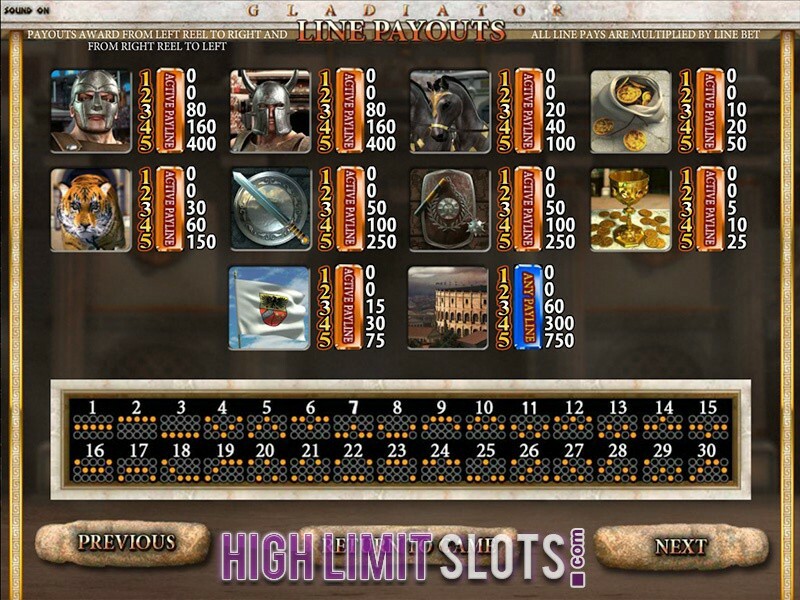 There are high limit slots games at this casino that are run on RTG software so you know you can count on them to run fast and offer you many benefits along the way. You will also want to consider MiamiClub Casino which offers games powered by WGS software, another software you can rust to give you access to slots games with an abundance of special features and more. You also want to take a look at Drake Casino since it offers you those impressive BetSoft slots games that will take you to a whole other place when you play. 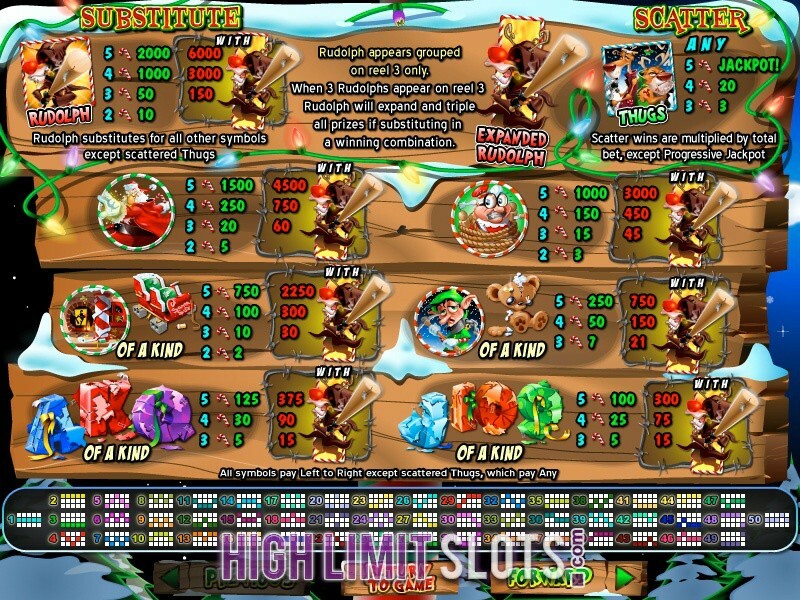 BetSoft slots have many animations and 3D graphics that can’t be found anywhere else. Each one of these casinos will offer you a US friendly gaming environment where you can enjoy some of the best high limit slots games you could ask for when playing at an online casino. .